An Englishman never jokes about a wager, sir. 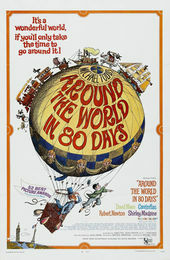 Author Brian Sibley discusses the end credits for Around the World in Eighty Days, from his audio commentary on the 2004 Two-Disc Special Edition DVD release. Even though Robert Morley has firmly announced that this is the end, the film's title sequence now begins, quite uniquely at the film's closing. Audiences who had begun to leave their seats sat down again to watch another film, in this case an animated cartoon strip version that combines cunning caricatures worthy of Hirschfeld, Victorian illustrations, Americana, Oriental art, and blatantly cartoony elements all seamlessly stitched together into an illustrated travelogue. The lively animated sequence is the work of Saul Bass, who began his Hollywood career as a graphic designer creating print advertising for film. In 1954 he was asked to bring his design sensibility to the title sequences for Carmen Jones; the success of this venture led to Bass' creation of a complete graphics style for films, that included logo designs, posters, and advertising campaigns, as well as the on-screen titles, creating an entire visual identity for the film in the public eye and mind. What's the best of Bass' graphic best? Well, The Man with the Golden Arm, Anatomy of a Murder, Psycho, Vertigo, North by Northwest, Advise & Consent, Exodus, Spartacus, It's a Mad Mad Mad Mad World, and West Side Story, for which he also devised the clever and moving closing credits sequence set to Leonard Bernstein's music. Saul Bass' film titles reflect the graphic style of the late '50s: economy, cleanliness of line, use of collage and montage, and a combination of vintage illustrative images such as period engravings with bold blocks of color and sharp outlines, or in many of his titles, a radical use of black and white imagery. The limited animation technique used here in contrast to the full-blown Disney style was originally pioneered in the post-war era by studios such as UPA, home of Mr. Magoo. What Saul Bass adds is a sophistication and a direct communication skill which is unique to the graphic designer. Many of Bass's title sequences and prologues serve as animated shorts establishing the atmosphere or defining the dynamics of the film yet to come, or in this case reflecting the film we've just seen. At a time when animated short subjects were beginning to disappear from the cinema screen, Bass kept big screen animation alive and in vogue through his stylish, snappy, clever, and inventive use of title sequences. Note that the main characters have also now become icons – the always running top hat watch for Fogg, the penny farthing bicycle for Passepartout, and the flowing veils of the Princess. I love the fact that the credits are themselves a journey, a linear progression with the cast and crew being introduced roughly in order of location and appearance, and running left to right across the length of a very long screen for minutes on end. As a designer, regardless of the aspect ratio of the film Bass was working on, he was a master at utilizing the shape of his frame whether conventionally sized screen or a dynamic horizontal such as this. Brian Sibley is an English writer. He is author of over 100 hours of radio drama and has written and presented hundreds of radio documentaries, features and weekly programmes. He is widely known as the author of many movie 'making of' books, including those for the Harry Potter series and The Lord of the Rings and The Hobbit trilogies.